Durban bay comes to the heavier part of the segment, weighing 32 lbs. the frame is made of high tensile steel having b type latch. 6 gear speed really help to attain smooth ride along the flat road and climb mountain. Folded dimensions of the bike is 33″ x 25″ x 14″. Mud guards are included, but you have an option to choose rack or not. Colors available in the market are black, white red and blue. This is a decent commuter bike, not meant for serious work. When you buy this bike, it looks decent, but lifting it up makes you realize that you’re holding a heavy bike. High tensile steel frame makes it very strong for the roads, but also heavy. The real problem of this bike is folding. 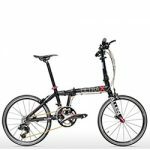 When you try to fold this bike up, the middle hinge of the main bar is very difficult to open and often make you to do extra efforts. Folding time of the bike is high, and that’s a problem. You really don’t want to only fold this bike and then forget about riding, because that what it does. 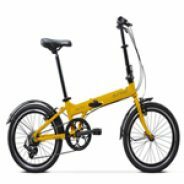 This is the only folding bike for long distance riding. Shimano gears are smooth, but when you speed things up, they don’t perform as expected. The shifting becomes less smooth, and noisier. They need oil and grease time to time. Once a month, you may end up seeing a mechanic. While testing for common day to day purposes, alloy v brakes are good, and they can stop you when required. Riding this bike is toughest thing, you get shakes, vibrations up your spine, and then you finally give up. Speaking about the heavy part, you just can’t hold it and use public transport, this bike makes it difficult. The bike is like every Durban I reviewed, same problems, just some added advanced features to lighten up the main problems. Light city roamers, commuters and fun loving adults are the customers of this bike, serious commuters won’t even touch this heavy frame.